All my Freebielicious friends/authors are sharing some spring-y freebies with you today! 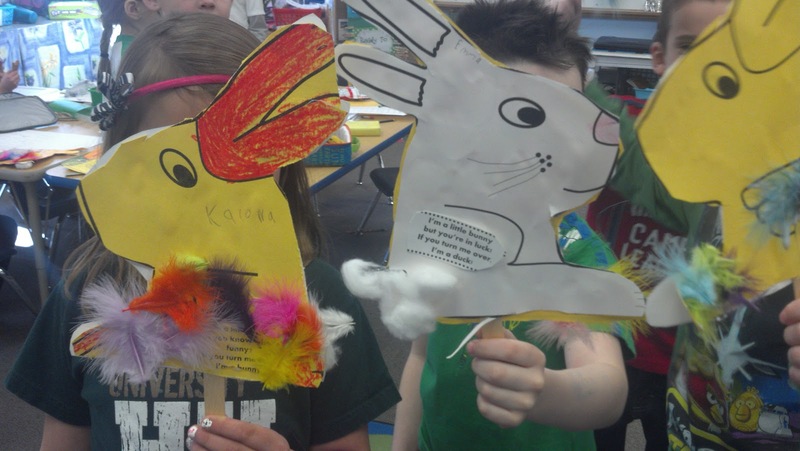 Hop along our bunny trail and fill your baskets with lots of PK-1 fun for your students for this upcoming week. First, Mrs. S and I performed our very best rendition of Little Bunny Foo Foo. The children were in awe as Mrs. S stole the show with her stellar performance as the Good Fairy. Dressed in her very best Good Fairy garb, she wasn't going to let the little bunny get away with anything! When she turned me (the naughty bunny--he he!) into a "goon", one of our sweeties said, "Okay, now turn him back into a bunny." I love how they get so into us pretending, that they actually forget we are pretending. I switched out the bunny for a duck (our best goon stand in) as we moved into our reading of one of my all-time favorite spring read alouds Duck! Rabbit! by Amy Krouse Rosenthal. 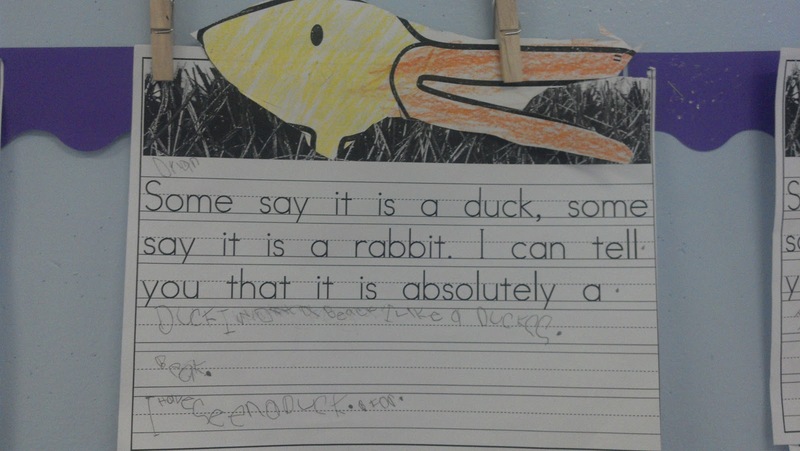 Is it a duck or a rabbit? Depends on how you look at it. This book is filled with humor as well as a subtle lesson for kids who don't know when to let go of an argument. 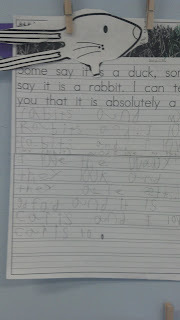 So, in our everyday kindergarten-teacher fashion, Mrs. S and I "argued" (read the book) our parts. 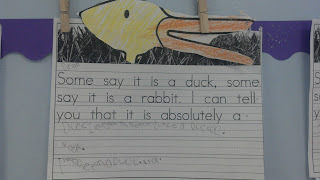 I say it's a duck, she says its a rabbit, and, in the end, we agree to disagree. It is such a fun book, written from a very unique perspective. 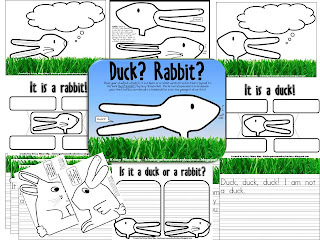 Here is the free miniature version of the duck/rabbit "reversible" puppet with poems imprinted on the animals. Just have students color, cut and glue the 2 animals together and while gluing a popsicle stick between them. Are you nervous about targeting the 3 types of writing required to be taught by Common Core Standards? This book is perfect to target any of the 3 areas. 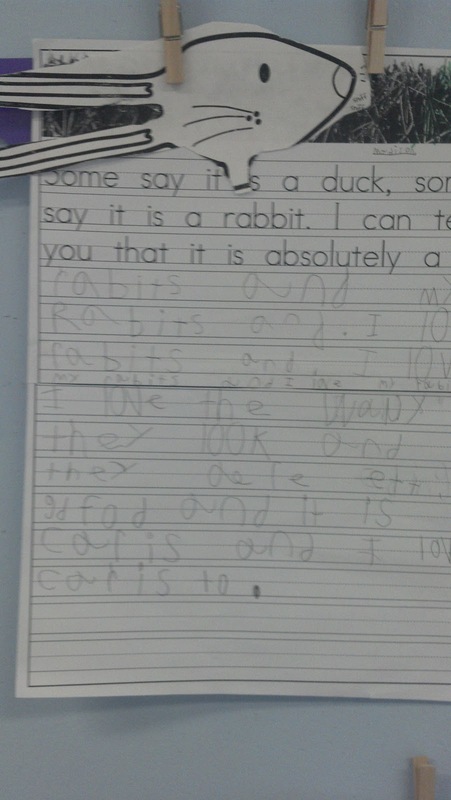 Use this book to encourage students to write their "argument" as to why it is a duck or why it is a rabbit. Click on this picture for more info about my ready to go kit for implementation tomorrow. Now head over to my fellow Freebielicious author Michelle's blog, Apples and ABCs and check out her incredible FREEBIE! Have fun hoppin' and fillin' up your baskets! I've never heard of this book. I love it though! I LOVE this book and what a cute activity to go with it! Thank you! Too cute Krissy. Thanks so much. So sweet! The kids are going to get the biggest kick out of this. Melt my heart with cuteness!! Thank you!! I am obsessed with that book and can't wait to use this!!!! Brilliant Krissy. As usual, this is SO darn smart. So cute! We love puppets. THANKS!! I just found out yesterday that I get to move to a great new school in our district teaching kindergarten from third grade. I'm nervous since all I've ever taught was 2nd-4th but so excited for this new journey. I'm your newest follower and am in the process of switching my blog name from Sparkling in Third Grade to Sparkling in Kindergarten. I look forward to learning from you and all your great ideas as well as getting to know you better.